SHORTIE SAYS...: Entice Me Week: STEPH MORRIS! 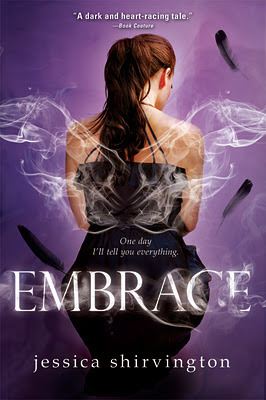 I completely fell in love with this series from the first chapter of Embrace. Honestly, this series is unlike any Angel series I've ever read. It's so different, so intense, so beautiful written. But we're not here to talk about the series today... we're talking about the lovely, the amazing, the intelligent and incredibly witty... STEPH MORRIS. She is one of my favorite side characters of all time. She truly is the perfect best friend. She's funny, and has completely comical lines that make you laugh. Steph is super intelligent. She's beautiful and has brains and knows how to use them both! She uses her smarts for good and to help the ones she loves. Plus Steph has the best wardrobe EVER. I definitely need to take her shopping and clubbing or something ridiculously fun that like! Want to know more? Keep reading on to see what Jessica Shirvington herself and Sourcebooks Fire has to say! The Best Friend A Girl Can Have! Steph Morris might be into boys and shoes, but when it comes down to it, she’s as smart as she is chic. From rock-climbing to clubbing to chasing down exiles, Steph is a best friend through and through. A flair for great fashion and a border-line high school genius, Steph is the perfect best friend for Violet. When she’s not with her boyfriend Marcus you can find her reading, but if you ask then it’s shopping—which is true anyway. In the vlog below, Jessica reveal secrets NO ONE knows about Steph – not even her best friend! Jess is speaking to us from the historic Queen Victoria Building Shopping Mall in Sydney, Australia – you couldn’t find a better choice! Want to know even more about STEPH? Check out her character bio! Also vote for your favorite STEPH Quote here! Make sure you go to the ENTICE ME DAY page to find out everything about this upcoming week + a AWESOME GIVEAWAY + where you can find other awesome things going on! PS. 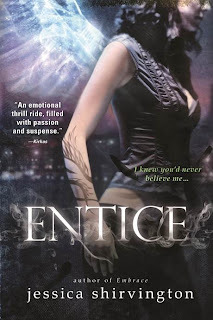 That awesome giveaway involves this: ENTICE ME DAY Sweepstakes: SourceBooks Fire is offering one lucky grand prize winner the chance to win a NOOK Color! We’re uploading this device with the e-books for EMBRACE, ENTICE, and early chapters from the next book in the series, EMBLAZE. PLUS, we are including a “YA Starter Library” with a selection of our other cool YA titles, for a total of about 10 books. The Sweepstakes entries will begin midnight on September 7th and end midnight on September 15th. Also stalk The EMBRACE TWITTER PAGE and the EMBRACE FACEBOOK PAGE as there will be tweets all through out the day with quotes from Steph, giveaways, and other fun things! Cool post! I should start this series.